In December, Hulu announced a new feature for the streaming service that brought unique user profiles to families who share one account, with personalized profiles offering each user their own Watchlist, viewing history, and recommendations based on their favorite shows. 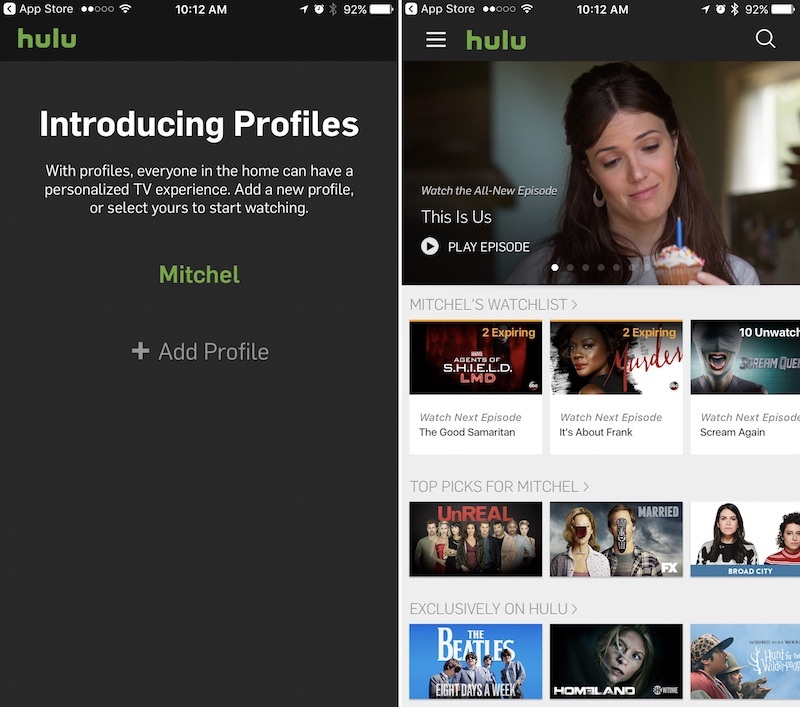 Available at first only on Hulu.com, profiles are now available to all users who have Hulu on their iOS device, through the new version 4.10 update [Direct Link] on Hulu's iOS app (via TechCrunch). Profiles will keep families organized as well as happy, according to Hulu, since everyone's favorite shows will no longer conflict with content they might not prefer that another member of the family watches frequently. There are also kid-centric accounts that parents can make without having to be concerned about mature content popping up in recommendations. Users on single accounts will simply choose their existing name on the app's launch screen to continue watching their shows as normal, while multiple-user accounts can begin adding new family members and friends with the "Add Profile" button. "Creating individual profiles enables you to keep track of all of your favorite shows and movies regardless of what other viewers in your household watch. Each profile created within the same Hulu account will have its ow personalized Watchlist, recommendations, and viewing history, allowing everyone to get the most out of their Hulu experience. You can also create profiles for your kids, where they can watch kid-friendly content without worrying about mature shows or movies being recommended to them." Although it hasn't been updated with mobile steps yet, anyone interested in learning how to create a user profile can follow the steps on Hulu's help website to learn more about the feature on Hulu.com and TV/living room devices. If only one profile can stream, what's the point of having multiple profiles? First I recently tested with 2 streams (but failed on 3) so not sure if the fully enforce 1 stream. But, clearly the reason for Profiles is so that my wife's watchlist is separate from mine. My wife and I have separate schedules so we do not always watch tv at the same time. Also, when my grandkids visit I prefer they have a Kids Profile. Profiles are very important to my use. Which is the same for Netflix. And if watching on two tv's at the same time we don't always watch the same service at the same time. Like maybe she is watching Directv Now and I am watch Hulu or maybe Netflix or maybe HBO etc. Any clue when this will be available on Apple TV? It's funny - Hulu used to be the joke, while Netflix was where everything we wanted to watch lived. Now we watch Hulu regularly (ad-free tier), while we're discussing cancelling Netflix because they've dumped so much of their third-party content. Nice but Hulu hasn't even implemented DD. Even paid. How about getting that done first to be at least on par with Netflix. My family has been using Hulu a lot more, so the profiles will be a welcomed addition when it comes to the ATV. My Hulu account used to have only my shows on the watch list, but now it is filled with all sorts of stuff that I have no interest in watching. I wouldn't say I would replace Netflix with Hulu, as I pay for both and am currently happy with both, but I do think that some of Netflix originals are overrated, and some are simply silly.... Like Sense8, how does that show have an almost 5-star rating. User profiles... a seemingly foreign concept in Cupertino:rolleyes:. Looking at you iPad. True. All but macOS has this. While I prefer my kids to have their own mobile devices. I think the Apple TV really needs user profiles. How does it work with the TV App?